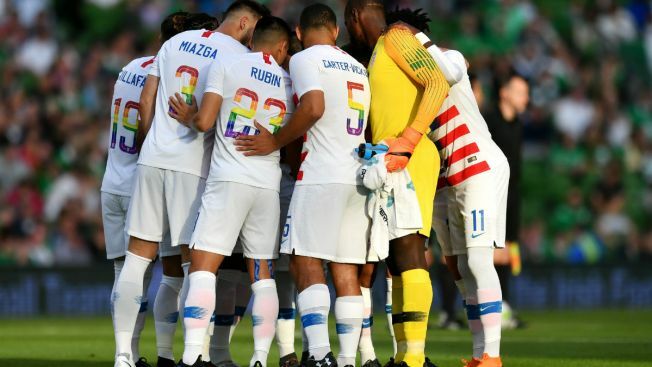 The United States and Ireland battled on the soccer pitch Saturday in a friendly match, and the team’s paid tribute to LGBT rights by wearing special jerseys in honor of the start of Pride Month. The men’s and women’s teams will wear the Pride jerseys in other friendlies this month, including a June 9 game against France. The Irish squad ended up winning Saturday’s friendly on a late goal from Alan Judge, securing a 2-1 victory. The American squad will take on France in Lyon on June 9, just days before the French squad heads to Russia for the FIFA World Cup. Meanwhile, Ireland will be off the pitch until September, when they take on Wales in a Friendly as part of the 2018 UEFA Nations League.